I wanted to pass along, if you had not seen it already, a site rolled out by the U.S. Department of Health and Human Services, called PHE.gov - "for Public Health Emergency" - that you should check out. Broken down into target areas to assist public health and emergency management officials, the site contains a wealth of vetted links and info for health and med services support, specific info for fed/state/local planners, medical countermeasures, international prep and response, context docs for public health emergency response and detailed info on a wide range of subjects for responders, clinicians and practitioners. In addition, the PHE coordinators are rolling out a complement of social media sites to augment the "hub" of PHE.gov including a PHE Facebook site, PHE Twitter Feed, PHE YouTube. One of the cooler things the site has accomplished is tackling the problem of a central resource for links to other State public health social media sites and outlets (which can be found at http://www.phe.gov/emergency/news/multimedia/Pages/statesocialmediasites.aspx). As a state agency involved in emergency management and operating in close coordination with our Colorado Department of Public Health and Environment, it is very interesting to have a one-stop to see what our colleagues around the nation are doing with social media and online outreach and emergency notification. Too, on the site, you will find links to the the latest National Situation Update and info regarding declared disasters and emergencies. Whether you are interested in all-hazard health threats, food safety, air and water quality info or mental health issues and support, related to emergency management, there is something for you here. So, take a minute and check out PHE.gov. I wanted to pass on the following release from our partners at the Upper Colorado River Interagency Fire Management Unit in Grand Junction, CO. It is fire season in the West. There are large wildfires burning in several western states including three in Colorado. 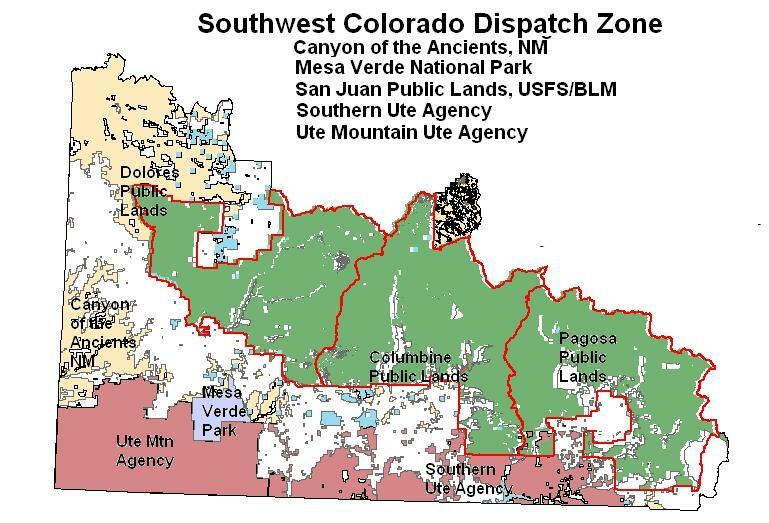 Since the first of May, fire crews from the Upper Colorado River Interagency Fire Management Unit (UCR) have responded to 25 reports of unattended campfires, with several burning well beyond the fire ring they were built in. Officials for the UCR report that forecasted fire danger over the next few days and for the July 4th weekend ranges from Moderate to Very High. While there are no fire restrictions in effect at this time, all recreationists are urged to exercise caution with open campfires, leaving no fire unattended and to make sure fires are completely out prior to leaving them. Avoid building fires you don’t need; however if you do, it’s recommended that you build campfires only in established fire rings within established recreation facilities. Recreationists should have plenty of water and a shovel near any fire while it is burning, and use plenty of water to put it out. Make sure the ashes have stopped sizzling and are cold to the touch before leaving the area. Fire managers have the flexibility to manage naturally started fires for multiple objectives, including allowing fire to play its natural, beneficial role in the ecosystem. However, all human-caused fires are suppressed are suppressed by firefighters and fully investigated. Human-caused fires often occur in areas with a greater potential to harm life and property. Fire officials want folks to enjoy their time outdoors; however, they also remind visitors that unattended campfires are not the only way human-caused wildfires get started. Smoking in brush area, heat from vehicle exhaust and converters, fireworks and other pyrotechnic devices are also major causes of wildfire. The use of fireworks or similar devices is prohibited on federal lands managed by the Bureau of Land Management, the Forest Service and the National Park Service. The ongoing mountain pine beetle epidemic is creating a build-up of fuels in many areas, making the possibility of human-caused wildfire even greater. Not only is the potential greater, the outcomes could significantly more costly and damaging. Fires should be reported by calling 911 or the UCR dispatch center in Grand Junction at 970-257-4800. Please be prepared to give as much information as possible regarding location and size of the fire when you report it. This 5 day L964 ICS Position Specific FEMA developed all hazards planning class is intended for local, county, state and others who are responsible or potentially responsible for managing multi-jurisdictional or interagency incidents for extended operational periods, as a part of a Type III or Type IV Incident Management Team. The workshop focuses on leadership principles, organizational skills, document preparation, operational planning, transitional briefings and Situational Unit Leader job duties. This class alone DOES NOT qualify an individual to be credentialed as a Situation Unit Leader as experience is also needed and documented through the task book process. An open task book in the Situation Unit Leader position (or Planning Section Chief) is required and must be faxed to 720-852-6750 upon registration. In lieu of a task book, DEM will also accept a letter of support from the emergency manager for those involved in Emergency Operations Center or emergency management operations. The National Institute of Standards and Technology (NIST), Boulder, CO, a component of the U. S. Department of Commerce, Boulder Laboratories has an opening for a Supervisory Emergency Management Program Manager, ZA-340-IV (equivalent to GS-13/14). The position is responsible for emergency preparedness, coordinating site-wide administrative operations and serving as Executive Officer to the DOC Boulder Laboratories Site Manager (BLSM) on Federal administrative laws, regulations, procedures and practices. This new position is being posted on 6/25 on http://www.usajobs.gov/. Interested individuals will apply to vacancy number NISTOD-2010-0039. The position is also being posted on http://www.usmilitaryclassifieds.com/index.php. The vacancy closes July 26th. Interested applicants can call Linda Rosales, NIST HR Advisor, with any questions. Lisa's contact number will be listed on the vacancy announcement posted on USAJobs. The purpose of the EM Basic Academy is to provide the skills and knowledge required for new emergency managers to effectively manage a Type III Incident in their jurisdiction. The EM Basic Academy is intended for emergency managers who have been in their positions for less than 3 years and whose primary responsibilities are in emergency management. Applicants must commit to the entire series of courses and the 5-day Academy, as well as provide a letter indicating supervisor support for their time dedicated to the program. Applicants will also require a recommendation for attendance from their CDEM Field Manager. The 2010 group is limited to 30 people. Applications will be available for distribution in July 2010, and are due by August 10, 2010. Prerequisites for this academy include: FEMA Professional Development Series (series of 7 independent study courses), IS 700, IS-800, and IS-1. These courses can all be found at: http://training.fema.gov/is/. The EM Basic Academy is free to those accepted to the program. Lodging will be provided by DEM for all resident courses for those who travel more than 50 miles, and course materials will be provided by DEM. Additionally, networking opportunities will be provided by CEMA at no cost to the group. For questions regarding this program, please contact the local CDEM Field Managers listed below or the program manager, Lori Hodges, at lori.hodges@state.co.us. Emergency responders representing the U.S. Army’s Pueblo Chemical Depot, Pueblo County firefighters and law enforcement and Colorado Department of Emergency Management, the Federal Emergency Management Agency and the Colorado State Patrol met today for a “tabletop discussion” as they plan and coordinate emergency response for potential wild land fires in the area. Today’s discussions will help planners as they prepare a scenario where all agencies will test their response capabilities. Approximately 20 personnel from the various agencies attended today’s event. 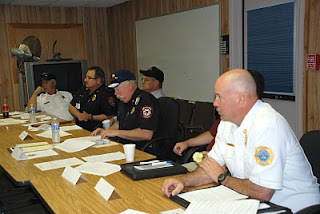 The tornado and fire seasons are both active in Southern Colorado and the fast moving events require quick response actions among all area responders. Any actual training exercises will be announced in advance. I wanted to pass along an announcement from READYColorado and the Governor's Office of Homeland Security's Citizen Preparedness Manager Cathy Prudhomme regarding a unique disaster preparedness skills training program designed for middle and high school students is scheduled for this summer in Aurora and Denver. Disaster READY Training provides students with an opportunity to learn and practice emergency readiness skills. The program is being delivered in a format that teaches a broad-range of safety skills with time devoted to practicing the newly acquired training in hands-on exercises and activities. In addition, the program gives students a chance to explore careers in emergency management, response, and preparedness from professionals working in a variety of areas and disciplines. 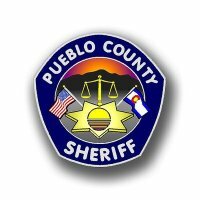 The middle school program is being offered on June 29, 2010 at Quest K-8 in Aurora, CO and the four day high school program is July 20 – 23, at the Denver Police Academy. Application materials are available at www.readycolorado.com/disasterREADYtraining. Space is limited and applications are reviewed on a first-come, first-served basis. Registration is free and open to all middle and high school students throughout Colorado. “Disaster Ready Training was created through a collaborative effort with local, state, and federal partners and volunteers working together to make Colorado’s communities aware and ready for all types of natural disasters and acts of terrorism,” said Cathy Prudhomme, Community Preparedness Manager with the Governor’s Office of Homeland Security. “The program is an opportunity to empower youth so they can make a positive impact in the lives of their families, neighborhoods, and schools during an emergency situation.” Disaster READY Training is sponsored by READYColorado, the Governor’s Office of Homeland Security, and the City and County of Denver, on behalf of the Denver Urban Area Security Initiative. Funding for the program is through a FEMA/U.S. Department of Homeland Security grant. 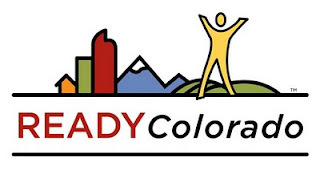 For more information and to register visit www.readycolorado.com/disasterREADYtraining. You can download the Disaster Ready Factsheet here and also download the One-Day Disaster Ready Summary and the Four-Day Disaster Ready Summary. The University of Colorado at Boulder is accepting applications for the Director, Emergency Management Division. Under the direction of the Chief of Police/Executive Director of the Department of Public Safety, the Director is responsible for the administrative, operational, fiscal and programmatic oversight of the Emergency Management Division’s programs and services. For a complete job description, listing of required qualification and to submit your application please go to www.jobsatcu.com (posting #810355). Application Deadline: The deadline for receipt of applications is 6/30/10. Salary is competitive and commensurate with skills and experience. The University of Colorado offers a full benefits package. Information on benefits programs, including eligibility, is available at www.cu.edu/pbs/. For additional information about the University of Colorado at Boulder, go to: www.colorado.edu/about/ataglance.html. The University of Colorado is an Equal Opportunity Employer committed to building a diverse workforce. We encourage applications from women, racial and ethnic minorities, persons with disabilities and veterans. Alternative formats of this ad can be provided upon request for individuals with disabilities by contacting Employment Services at (303) 492-6475.